Move-N-Order 4 Bedroom Kit (Shipping Included!) | Enuff with the Stuff – Sort Stow and Let It Go! Save Time, Save Money, and Reduce Stress on Moving Day! 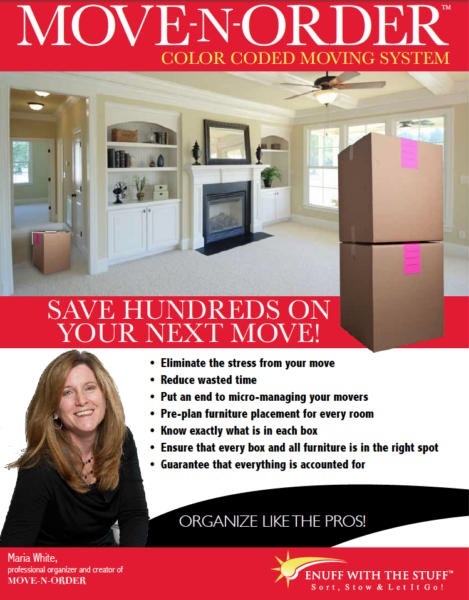 Move-N-Order, designed by professional organizer Maria White, is a color-coded moving system created to ensure every box and piece of furniture gets into the correct location in your home the first time! “We always recommended using labels to our residential clients to help speed things up and stay more organized but we never had anything to offer or give them. But I swear your packet is the perfect solution to all of that! Especially when a job is by the hour, just in the time it takes the movers to track down the customer and ask “where does this go?” saves time off the job and it just makes sense that if it takes the guys an extra 15 minutes of “where does this go?” the kit will have easily paid for itself! I honestly feel you would be cheating yourself out of a better, more organized, less expensive move by not having this labeling system in place. Call 703-729-2455 for information and placing your order.